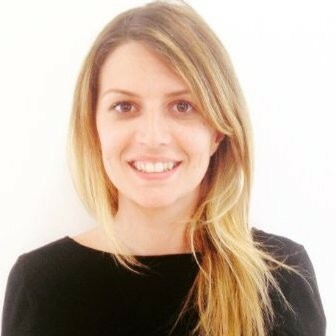 Editor's Note: This post originally appeared on the LinkedIn Marketing EMEA Blog. I bet you that I can name one of the most important audiences for your next marketing campaign. I may not know which business you work for, or what your particular marketing objectives are. However, I do know that there is almost certainly one very well-defined group of people who will be critical to achieving them. The good news is that these people are phenomenally easy to reach. You know exactly who they are and where they are. And you don’t have to pay a media platform or a publisher for the right to talk to them. The bad news is that, despite their accessibility and their importance, there’s a decent chance they are not on the media schedule for that upcoming campaign of yours. Far too many businesses, and far too many marketers, continue to leave their employee audiences out of their campaign planning. It’s a critical missed opportunity. Before you stop reading this post and consider sharing the link with someone in HR instead, I’m not talking about the task of engaging your employees with your business in general. This isn’t about communicating with them regularly or building an employer brand that gives everyone a sense of shared ownership and purpose. These are all vital business imperatives in their own right, but the chances are you already have a team focused on them. And if you’re a progressive marketer, you might already have time set aside in your diary for working with HR and recruitment on building a talent brand that can support them. I’m talking about something different: the specific need to include your employee audience within the planning and execution of your external, customer-facing marketing campaigns. I’m talking about the need to raise awareness of your marketing messages internally at the same time as you communicate them externally. And I’m talking about the need to apply the same creative thinking to doing this as you would when creating an advertising or content marketing campaign. Over the last few months, I’ve been on my own journey where marketing to employees is concerned. I’m an Associate Brand Marketing Manager at LinkedIn Sales and Marketing Solutions, which primarily involves planning and executing campaigns for customers and potential customers. However, since October last year, I’ve also taken on more responsibility for engaging our relevant employee audiences with these campaigns. It’s opened my eyes about the impact that a successful internal launch can have on your effectiveness – and about the huge gains that you get when you start applying creative marketing principles to talking to your colleagues. Your internal audiences ought to be involved in the success of your campaign in three ways. Some of them will be involved in building the proposition that you are communicating to buyers. All of them should be involved in amplifying your message and advocating for your solutions. And any of them could find themselves involved in the experience that your customers and potential customers have, where they will have a vital role in making sure that your proposition aligns with reality. I’ve learned that your internal audiences are also a vital test of the integrity and credibility of your external marketing campaigns. If they don’t buy into what you’re planning to say then they won’t amplify it effectively – and they will struggle to deliver an experience that aligns with it. And if you can’t engage your colleagues with what you’re doing as a business, then what chance do you really have when talking to people who don’t work with you? These are the reasons why I believe that internal audiences should be a key part of your external-facing campaign planning from the start. But what should that campaign planning look like? This is where I’ve been most excited about exploring the new aspects of my role. When you start to take employee audiences seriously, you find that you’ve got fantastic scope creatively when it comes to how you engage them. Marketing to an external audience starts with interrogating what you know about that audience, tailoring your approach to their needs and quite possibly segmenting the audience so that you can do this more effectively. You’ll spend a lot of time thinking about the best opportunities for capturing their attention, when they are more likely to focus on what you have to say. And you’ll carefully develop creative that’s impactful, to make the most of these opportunities. When we talk to internal audiences as marketers, far too much of this seems to go out of the window. We assume that a one-size-fits-all approach is fine, fire out a quickly worded email about what we’re doing and assume that everyone will read it out of a sense of duty. The first rule of better internal marketing is to aim to apply the same standards that you would to external marketing. Start with a strategy. Think about your different audiences and the moments in their working day when they are most ready to engage, then tailor your approach to fit. This doesn’t have to involve spending a large marketing budget – but it should involve thinking like a marketer. Don’t believe the old saying: a well-chosen image is worth a lot more than a mere thousand words. Striking visuals are one of the most important assets of any marketing campaign, and that applies to internal audiences every bit as much as external ones. Over the year, we’ve been working on building more emotional connection into the visuals we use for our internal campaigns. For the launch of our ‘Get Closer to the Right People’ brand campaign, we used striking close-ups of faces in beautiful black and white. They proved particularly impactful and inspired us to find different ways to get those images in front of people. As an internal marketer, you have to get used to looking at your surroundings as a media opportunity. Some parts of your creative canvas are obvious: digital signage and screens, pull-up posters and notice boards. However, one of the exciting things about the past few months has been exploring the other types of opportunities that are available. Often these can have more impact, because they reach your colleagues at different moments. 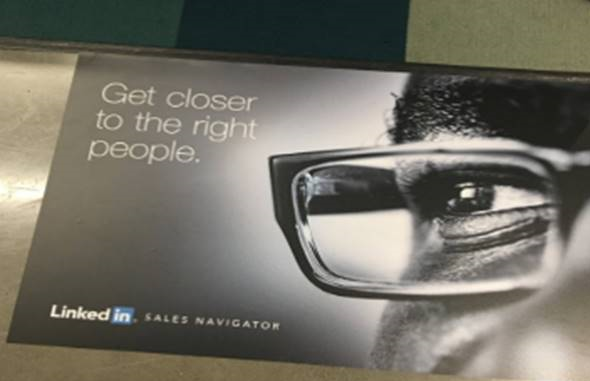 For ‘Get Closer’, we used one of our external-facing OOH executions (a giant poster on the side of our building) as a focus for our internal campaign. We launched a competition to find which of our colleagues could capture the best selfies with the poster as they arrived for work in the morning, or left at the end of the day. We positioned branded floor tiles around the office that helped to grab people’s attention, because they weren’t used to seeing something so striking when they looked down at the carpet. 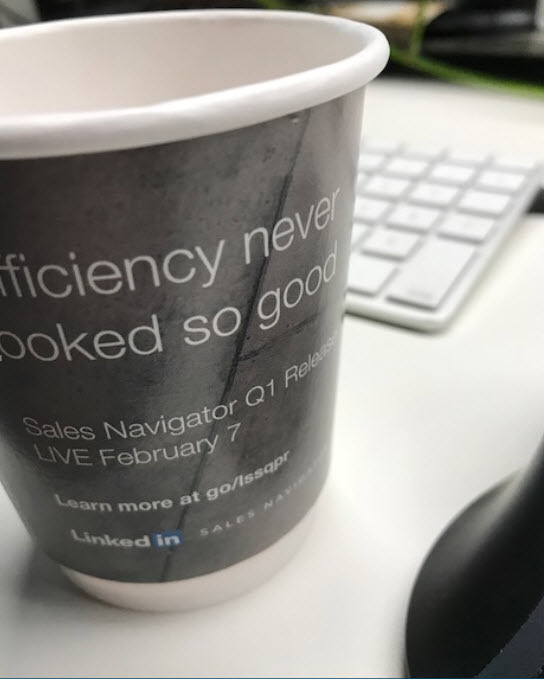 When we launched an internal marketing campaign for our quarterly product release, we got a really positive response from branding the cups in our cafeterias. We also created striking posters for our washroom mirrors that gave them the look and feel of a beauty salon and encouraged people to take their own selfies and share them. I’m really proud of the media ideas for these campaigns. They worked so well because they focused on spaces where we knew our colleagues would feel relaxed and ready to listen. We were careful not to impose too much on their busy times –and we didn’t take their attention for granted. Whether it’s selfies or branded cupcakes and coffee cups, interaction is a powerful asset in internal marketing. It shifts your audience’s mindset from being told information to engaging proactively, and that can help to build the sense of shared ownership that you are looking for. Remember, you are probably marketing to people who had a big role in creating the solution that you are now communicating about. Celebrate them and make them feel a part of what you’re doing. Respecting your colleagues’ attention isn’t just a case of innovating with how you reach and engage them. It also involves being concise. We try to keep our messaging short and snackable, using visuals to help communicate ideas quickly. We’re also selective about how frequently we market to our own people, so that we generate greater impact and excitement when we do. A good approach is to plan an internal marketing campaign on two levels: an awareness-building campaign that doesn’t try to communicate too much information at once, supported by clearly signposted digital resources that people can navigate in their own time. You’re aiming to engage people who are already surrounded by an enormous amount of information and trying to multi-task their way through it all by the end of the working day. Another email in their inbox isn’t going to stand out – and it’s probably not going to be appreciated either. We try to use digital channels that enable people to engage in the timeframe that works for them. That’s why the LinkedIn Feed and Elevate, our employee advocacy platform, have a big role to play in our internal-facing campaigns. We’re aware of how a platform like LinkedIn can help us to tailor our approach to different audiences amongst our colleagues as well. Awareness-building executions like posters or branded cups can work across these segments. However, we might want to create different content and messages for the engineers who helped build a product that we’re marketing – and the sales teams that will be talking to people as a result of our campaign. LinkedIn targeting enables us to do that. You can’t optimise and improve your marketing if you can’t measure it – and that applies just as much to internal campaigns as it does to external ones. The metrics aren’t always as obvious, but you can still define clear objectives for what you’re trying to achieve and explore innovative ways to measure progress. Any campaign that invites interaction provides a metric for assessing whether employees are engaging with your message. When you’re directing people to websites and digital resources, you can track traffic. And platforms like LinkedIn Elevate provide detailed metrics on how employee engagement with your marketing is translating into wider reach through advocacy. And don’t ignore the value of getting out there and asking people from different teams whether they are aware of what you’re doing. Some of our best ideas have been shaped by this type of qualitative feedback. Over the last few months, I’ve had my own eyes opened to the creative potential in internal marketing campaigns – and the value that you unlock when you get it right. I’ve seen the significant organic reach that we gain through employee sharing and the excitement that colleagues feel when they’re invited to play an active role in what marketing is doing. It’s made me feel more fulfilled, more confident and more effective as a marketer – and I’m confident it will do the same for anyone else who prioritises internal engagement as part of their next campaign. To keep pace with the latest thinking in marketing, subscribe today to the LinkedIn Marketing Blog.